Turn off all burners and gas appliances completely. Extinguish any ignition sources such as open flames. 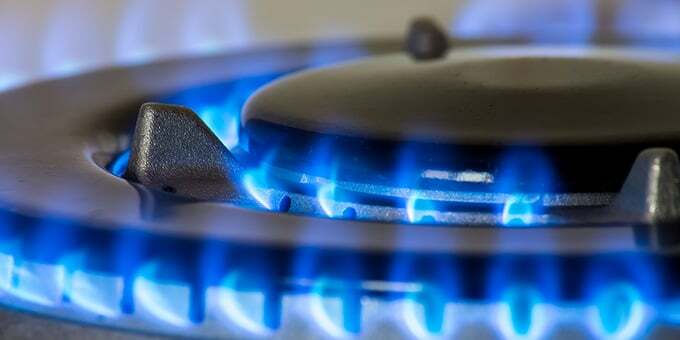 Check pilot lights on gas appliances to see if they are lit. If you are unable to determine the source of the gas odor, call your gas company and report the odor. Relight extinguished pilot lights only if you know how to do so safely. Otherwise, call an appliance maintenance professional. Quickly extinguish any ignition sources, such as candles, burners, or embers. Evacuate the building immediately, taking all residents with you. Notify others in the area of the possible leak. Do not use lights or any electrical equipment that might produce a spark. Once safely outdoors and away from the building, call the gas company or 911 with a cell phone or from a neighbor’s phone to report the odor. Do not place the call from inside the building where the strong odor is occurring. Do not renter the building unless instructed to do so by emergency personnel. Leave the area where the smell or sound is occurring. Do not do anything that could create a spark, such as lighting embers, fires, or fireworks. Once away from the area of smell, contact the gas company or emergency responders using a cell phone or neighbor’s phone. KPA offers toolbox talks that educate employees on natural gas and the associated hazards. Other toolbox topics include: how to properly handle various acids and bases, carbon monoxide poisoning, and preventive safety measures.